Lüscher’s innovative solutions augment the Heliograph portfolio in many segments of the offset printing market. The universally configurable internal drum laser CTP systems in the XPose! series are available in up to XXL format. They come with either thermal laser diodes of 830nm for thermal offset plates or UV laser diode arrays of 405nm for conventional offset plates. 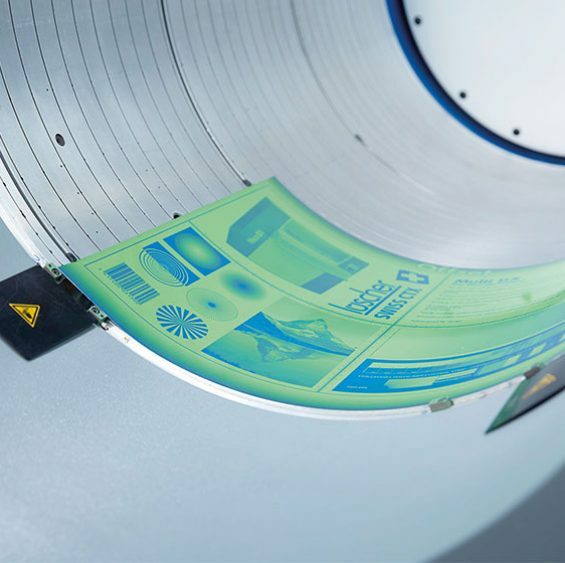 Perfect imaging is also possible for the waterless offset plates used in conjunction with Lüscher technology for printing bank cards, customer cards, and other plastic cards, and for wet offset plates that are suitable for baking. The laser head of XPose! internal drum CTP systems is ideally positioned immediately above the printing plate surface and is focused automatically for maximum precision. Easy handling of plates that vary greatly in size is also possible in this system, because they can be secured easily and effectively using pins and a vacuum. In addition, Heliograph offers a medium-­format external drum CTP system called XDrum! UV. When this system is incorporated in the Suprasetter platform from Heidelberg users can now also enjoy the benefits of UV diode laser imaging. The crossover technology from Lüscher’s CTP systems also scores highly when it comes to printing security features using the offset method. The exceptionally high maximum resolution of 10,160 dpi in the XPose! and MultiDX! is ideal for microtext and hidden elements. This makes Lüscher’s solu­tions popular with service providers specializing in printing bank cards and similar counterfeit­-proof identity and functional cards. The high imaging resolution corresponds perfectly to the high-­resolu­tion waterless offset plates of Toray and Presstek. The ultra-­high resolution XPose! is also used to make plates for printing banknotes.